"As a GPP-Certified product, our 60-ton welder comes with a three-year, leak-free guarantee. That saves costs and eliminates headaches for our customers," said Lowell Tully, IFW President. "GPP also helps us promote our products, because it adds such tremendous value to what we offer." As a custom manufacturer of friction, hybrid and inertia welding systems for the machine tool industry, IFW serves customers in the automotive, aircraft, heavy equipment, off-road and farm equipment markets. Committed to using the best technology available, the company enjoys a well-deserved reputation for delivering quality, high-performance equipment that meets or exceeds customer specifications. 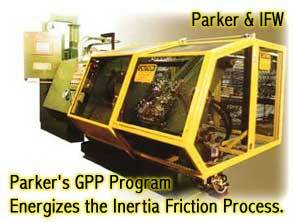 Partnering with Parker through the Genuine Parker Parts (GPP) program is one of the ways IFW built in quality from the beginning on a 60-ton welder for a marine engine manufacturer. As the product name suggests, the machine applies 60 tons of pressure in a process that creates a single, high-integrity joint form dissimilar metal components. The bi-metal part resulting from this technology limits the use of costly metals to exactly where they are needed. In addition to saving money, the inertia welding process helps to conserve natural resources. IFW's 60-ton welder uses Parker's Seal-Lok O-ring face seal fittings and hose assemblies, Parflange tube assemblies, and 451TC Hose - connections that help IFW offer the most advanced control packages ever manufactured for friction welding systems. Backed by GPP's Dry Technology training from Parker and full-line Parker distributor, Depatie Fluid Power, IFW will continue to forge relationships with customers that are every bit as strong as its high-integrity bi-metal joints. Copyright � 2002 by SSD� Control Technology, Inc.